In China at this current time there are two forces that co-exist – religious conservatism and secular progressiveness. Both are the product of the 1949 Revolution, and the Cultural Revolution (1966/76), but also have roots in Chinese history prior to 1949, beginning with the collapse of imperial rule in 1911/12. As the Chinese nation develops and advances from feudalism, into modernism and postmodernism, the socio-cultural forces of the old and the new are clashing, integrating, repelling and attracting. As a very large landmass China’s economic growth is asymmetric and not even across the country. Development is a matter of perspective and at the upper end of the scale China has seen massive socio-cultural advancement in literacy, education, science, manufacturing, tourism, diplomacy, military development, commerce, and for a small but significant number of people, social mobility. These are outstanding achievements in a short space of time. Much of this advancement has been evident since the late 1970’s rule of Deng Xiao Ping whose administration over-saw the transition of China’s economy from that of ‘fixed’ and reliant on the Soviet Union, to that of the free-market, successfully trading with the Capitalist world. China remains politically Communist, but has developed economic institutions that engage the Capitalist world system and thus create and import external wealth into the Chinese heartland. Ironically, it is the economic powerhouse of the United States that has granted China ‘most favoured nation status’, and allowed this transformation to take place. Prior to this policy, which ultimately stems from Nixon’s visit in the late 1970’s, the US had a definite policy of economically embargoing all Socialist and Communist regimes, (such as the small and insignificant island nation of Cuba which is still subject to the ban), but in an attempt to drive a wedge between China and the USSR, the USA economically engaged China, operating under the mistaken idea that such an engagement would transform China away from its Communist path. In reality this has not been the case and demonstrates the USA’s misunderstanding (and misrepresentation) of the theory of economics as portrayed by Karl Marx. Karl Marx clearly wrote (in Das Kapital) that a country must first be a very well develop ‘capitalist’ economy BEFORE it can transition into a Socialist, and then Communist state. Deng Xiao Ping did not betray Mao’s Revolution, but rather moved it on a path back toward the original Marxian thinking and away from dependence upon the USSR. It is a clever strategy that enters the lion’s den of anti-Communism – and utilises the enemy’s strength against itself. The USA pays billions of dollars to China in an attempt to destroy Communism, whilst China uses the same money to ‘strengthen’ the infrastructure of its country to pave the way toward the achievement of Socialism and Communism. This can happen because neither Marx (nor Engels) defined exactly what this new state of existence would actually be like, other than describing how it would come about, and the driving forces behind it. 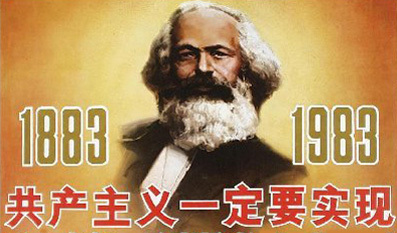 The point Marx was making is that a ‘new’ and ‘unique’ socio-cultural formation based upon a Socialist and Communist Revolution would be a radical departure from that which is current or familiar. It can be defined in terms of what it is not; it is not bourgeois in nature, it is not exploitative, it is not unequal, it is not oppressive to its citizens, it does not discriminate on grounds of gender, race, disability, age, origination, language, religion, or sexual orientation, but its exact manifestation will be a matter of the time it occurs. A time that will be unique to its arrival. Such a manifestation will usher in a new psychology of perception, and this new identity will be difficult to perceive from the contemporary, greed-orientated mind-set that humanity currently inhabits. All Marx can say on this point is that the new world of equality can only be described as ‘not this’.